During the course of creating a full-body, six-degree-of-freedom motion platform for racing simulation, two San Jose State University students took a little side trip to make this deceptively simple-looking robot. It has the amazing ability to perfectly balance a ball in the exact center of the platform, even when you try to knock the ball off. 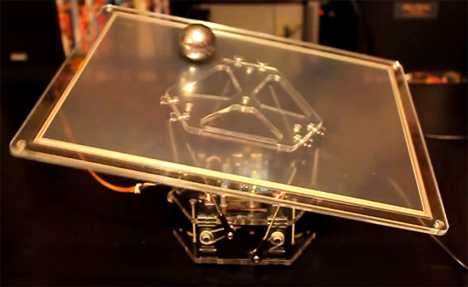 The robotic platform is a proof-of-concept for the duo’s larger project. The students, Tyler Kroymann and Robert Dee, formed Full Motion Dynamics to realize their goal of the larger motion simulator. This smaller machine also works with six degrees of freedom and a resistive touch panel mounted on its platform as an input device. 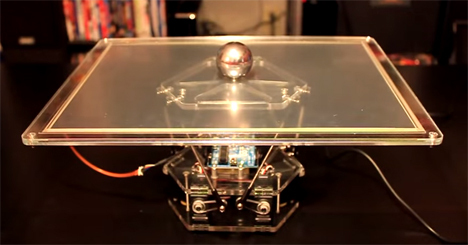 Whenever a ball is placed on the Arduino-powered platform, the platform corrects it position to keep the ball perfectly centered. When an evil hand darts in to flick the ball off of the platform, it reacts quickly to correct the ball’s position. When the hand lifts the ball, the platform vibrates as though protesting the absence of its purpose. Full Motion Dynamics has received such interest in the little robot that they are planning to release it commercially as a whole or in kit form. See more in Robotics or under Technology. December, 2014.